This playground's low concrete walls define the play space, which features a granite-faced climbing pyramid with slides and tunnels, and a concrete fortress-like water spray feature. Play features include tire swings and strap swings, slides, a chain-net climber, and a sand table. Water spray on multiple sunken and elevated levels connected by ramps and tunnels. The Central Park Conservancy renovated the playground in 2015 to improve its accessibility and connection to the Park landscape. 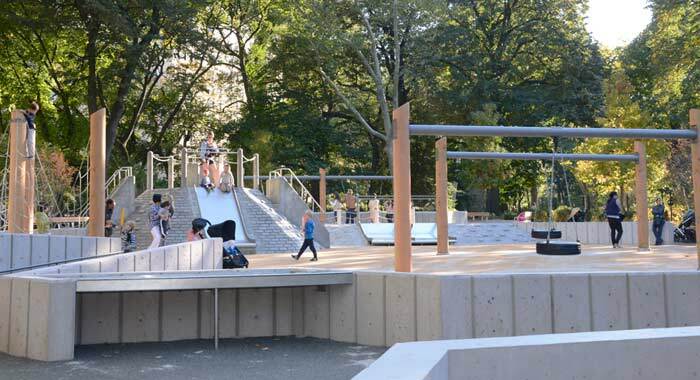 This renovation was part of the Central Park Conservancy's Plan for Play initiative to elevate all of the Park's 21 playgrounds to the same standard of excellence, and make sure children of all ages and abilities will enjoy Central Park's playgrounds for generations to come.